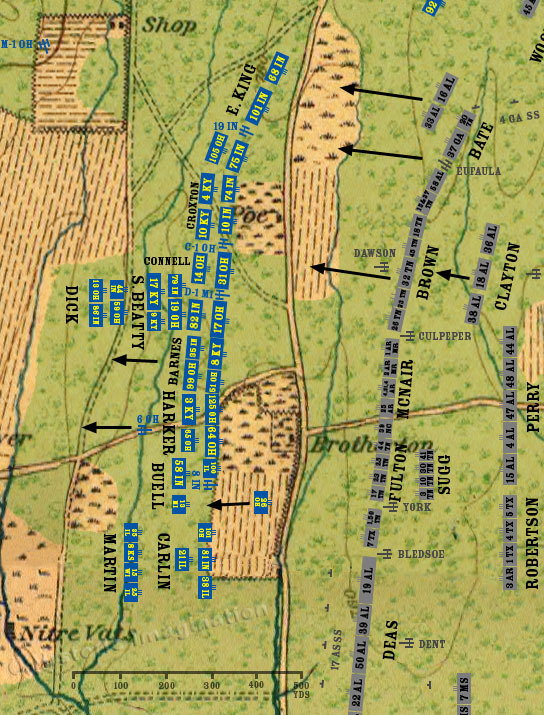 General Longstreet’s early morning shift north, in a failed attempt to make room for Hood’s Division on the front line, blocked the advance of Deshler’s Brigade of Cleburne’s Division. Since General Stewart didn’t see the division to his right advance, he did not begin his attack. This upset General Bragg’s en echelon plan of attack. To get the battle moving again, Bragg skipped the chain of command and sent orders directly to all remaining division commanders to attack at once, regardless of circumstances. General Stewart received his first, and promptly ordered his division to attack. The two regiments of Wood’s brigade that had wound up in front of Bate agreed to advance with them. On the Union side, events reached a critical stage. In response to Breckinridge’s attack, General Thomas had asked for Brannan’s division to help with the fight to the north. Van Derveer’s brigade had already been sent, but the rest of the division couldn’t follow without being relieved on the front line. Unfortunately, Rosecrans thought the division had moved. To fill the gap that wasn’t there, he ordered Wood’s division to move north to cover the space. To add to the confusion, the staff officer who wrote the order was French did not speak English well, and was not normally tasked to write orders. The order was confusing and contradictory. It told Wood to close up on Reynolds, that is, have his left-most unit make contact and touch Reynolds’ right-most unit, and support him, which means to form behind Reynolds as a second line. Obviously, Wood could not both form his division to the right of Reynolds’ division and behind it at the same time. In addition, Brannan’s division was still on line and between Woods and Reynolds. General Wood asked for advice from General Alexander McCook, commander of the Twentieth Corps. Wood maintained afterwards that McCook authorized the movement, stating that he would fill the gap created by his departure with units from the Twentieth Corps. After the battle McCook denied this. With approval from a higher ranking officer, and potentially to avoid another upbraiding from Rosecrans, Wood begins to move his division. Barnes and Harker are the first to leave. Buell, still dealing with the consequences of the 100th Illinois’ unauthorized charge, balks at leaving. The 26th Ohio is still retiring after covering the 100th’s withdrawal. Due to the limitations of showing all the units on the map, it looks like Van Cleve's division extends west of the Glenn-Kelly Road. This is not the case. The division is but a few yards behind Brannan. In fact, General Samuel Beatty's front line is only 50 yards behind the rear of Connell's brigade. So in actuality, all of Van Cleve's division is formed compactly in the woods behind Connell.